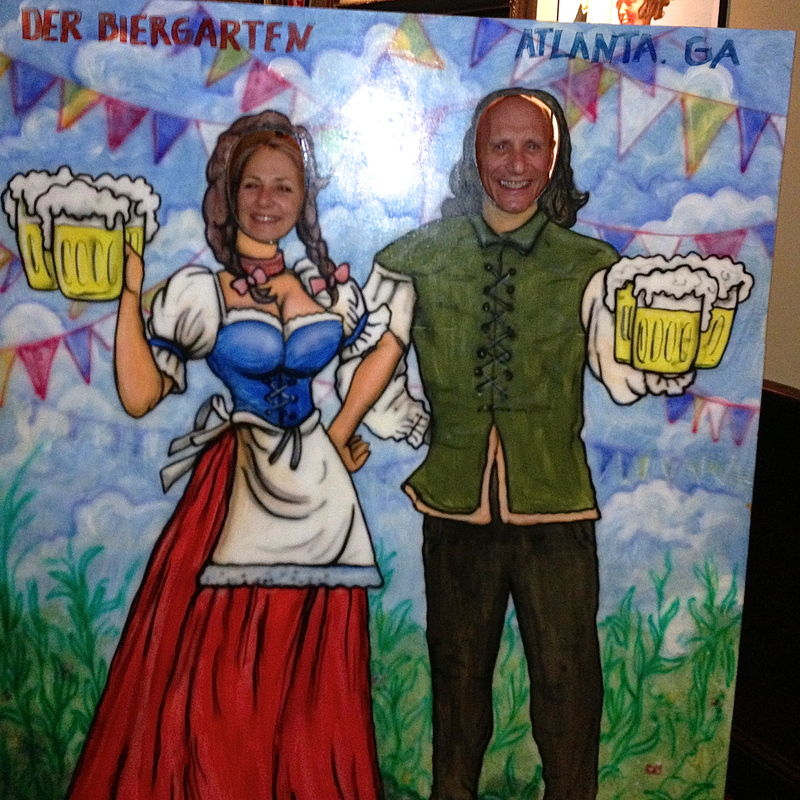 It’s Oktoberfest in Atlanta, and to celebrate, Date Night drinks a lot of beer and eats large quantities of German food. 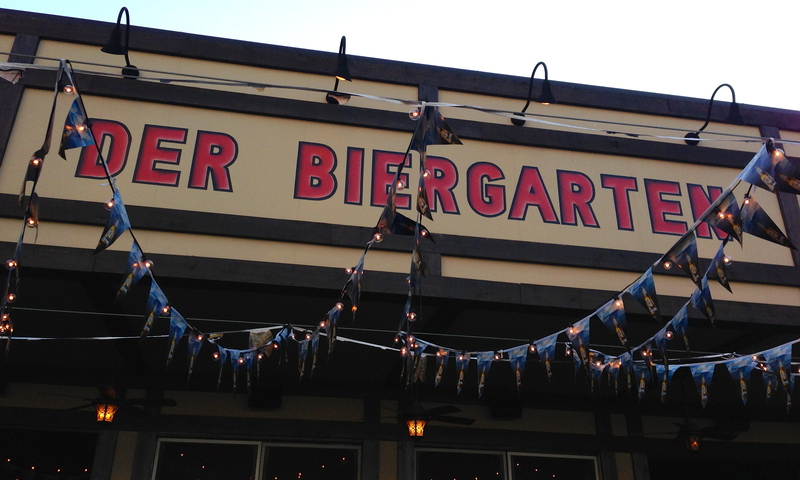 We are at Der Biergarten, which was recently voted one of the Top 10 Beer Gardens in the country by The USA Today. Read on as Date Night discovers “Munich on Marietta Street”. A little bit of “Munich on Marietta”. Accompanying us on tonight’s date are our dear friends Claudia and Randy, who have travelled inside the perimeter to celebrate with us. Der Biergarten is in a festive mood tonight, and with the beer specials they are featuring during Oktoberfest, so are the patrons. 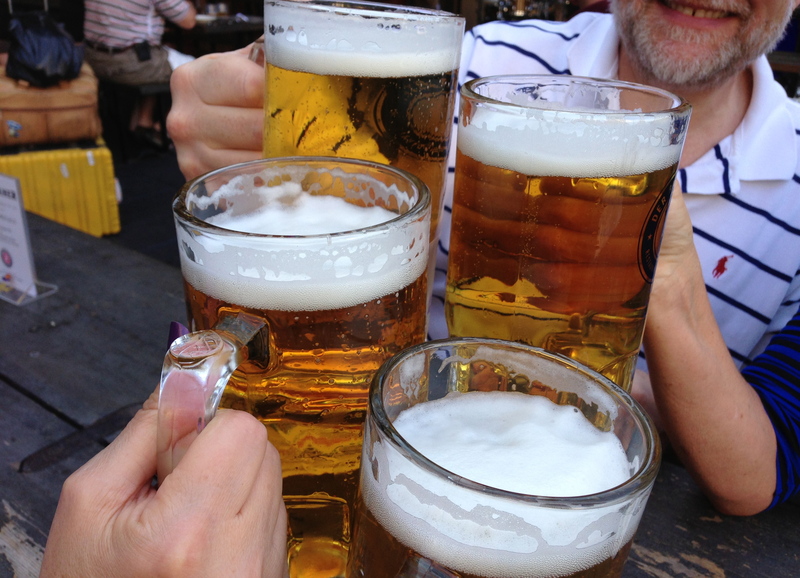 We start off with four liters of beer, the Paulaner Oktoberfest Weisn, which happens to be going for $8 tonight. It’s a beautiful night in Atlanta and most of the outdoor tables are filled. The Braves game is on the television and we all have an eye on the game while we chat and drink the smooth German beer. A great place to celebrate Oktoberfest. 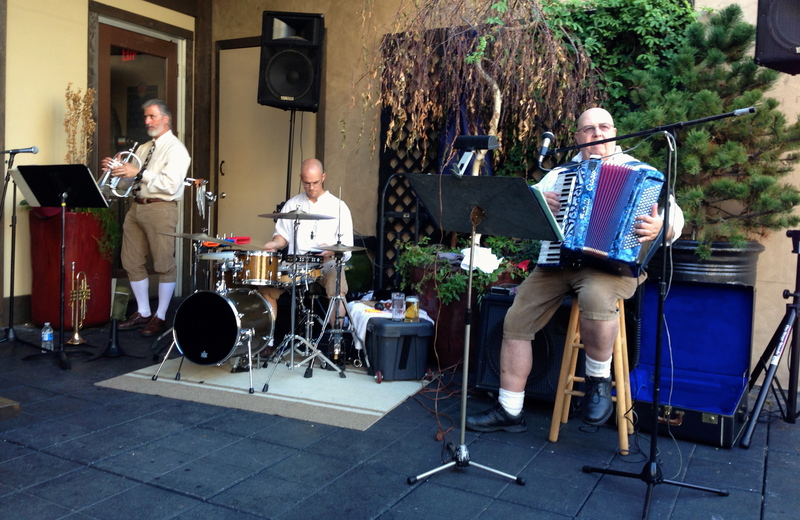 Providing the sound track for tonight’s festivities are the Bavarian Express, a German Oktoberfest band. They are rocking those tunes on the accordion and the flugelhorn, and this is the perfect setting for them. They are playing for food and beer and are having a great time, and we are having a great time listening to them. The Bavarian Express rocks Der Biergarten. Every now and then they start singing “Ein Prosit”, a Bavarian drinking song and everyone in the place stands and toasts each other and drinks. A ploy to sell more liters of beer? Perhaps, and it’s working. 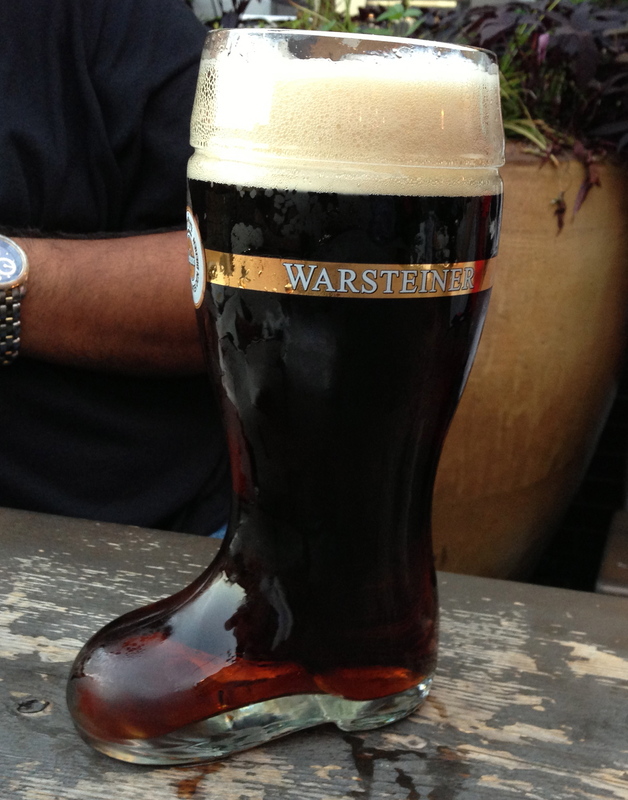 Speaking of beer, that boot looks pretty good. Buy one for $30 and the refills are only $8 every time you come back. 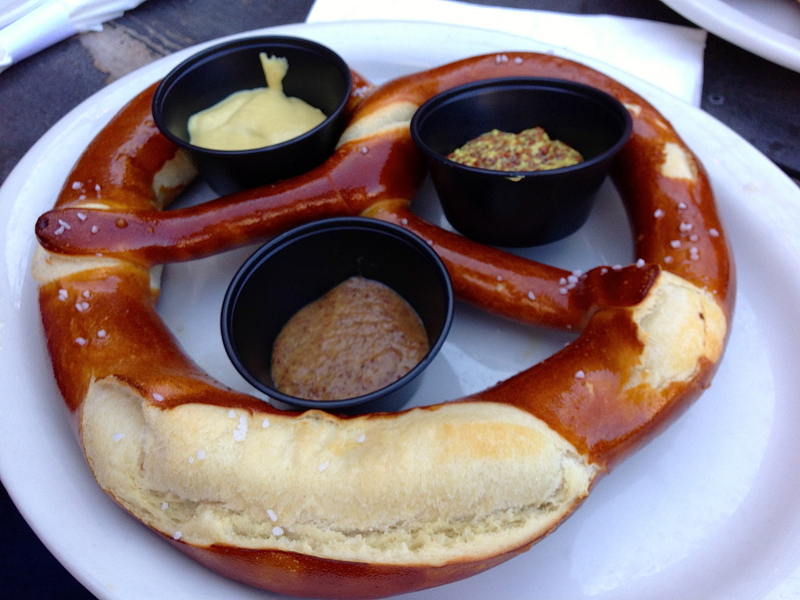 When you are drinking in a beer garden, the first thing to order is simple: a giant pretzel. Ours comes with three different kinds of mustard and is plenty to share for two. Is this pretzel smiling at us, or is the beer too strong? Dinner for six. Come hungry and bring lots of friends. We even take pictures of other people’s food! 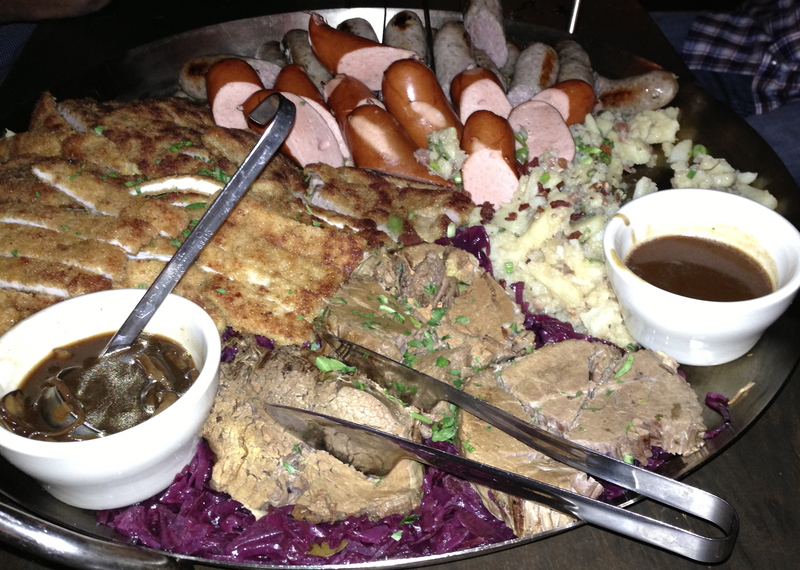 This is dinner for six, featuring schnitzels, sausages, brats, and wursts, the best stuff on the menu. It was too much food for the four of us, but the six guys at a nearby table look very happy with this. Anyone want to help us eat one of these some day? 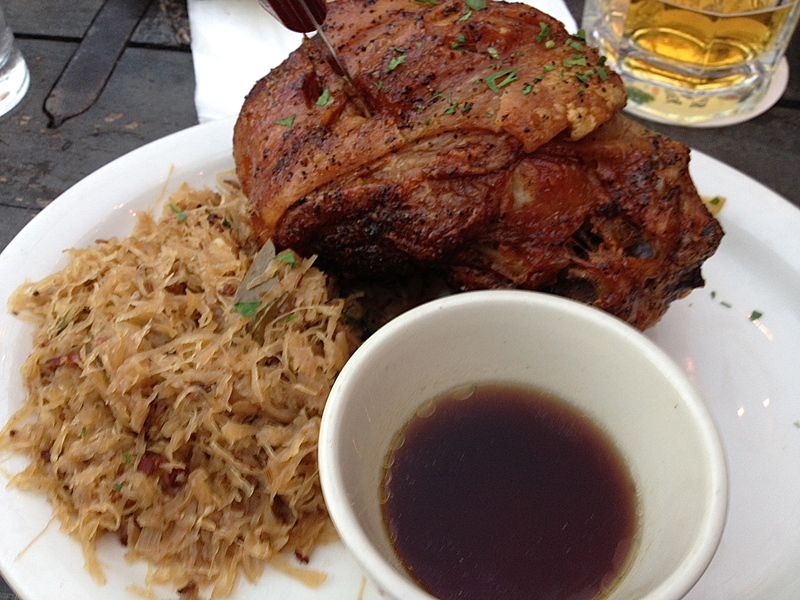 What we do order is the schwienshaxe, which German food lovers know as the rotisserie pork shank. C & R order the same. It comes with a side of sauerkraut, as close to a veggie as you can get here. Which reminds me of an old joke…what do you call a grumpy German? A sauerkraut! 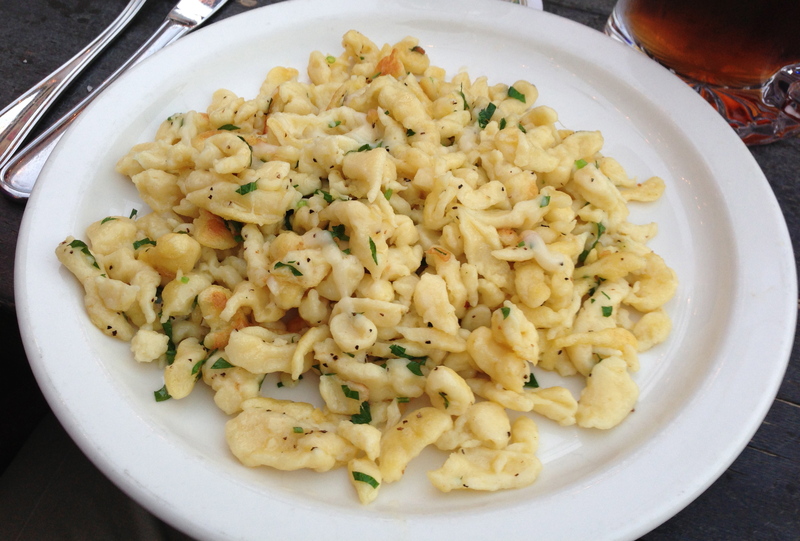 We also order a side of spatzle, which is egg noodles and cheese. German mac and cheese? Good stuff! Although we probably should get dessert, we do not as we are full of beer, pretzels, and good food. 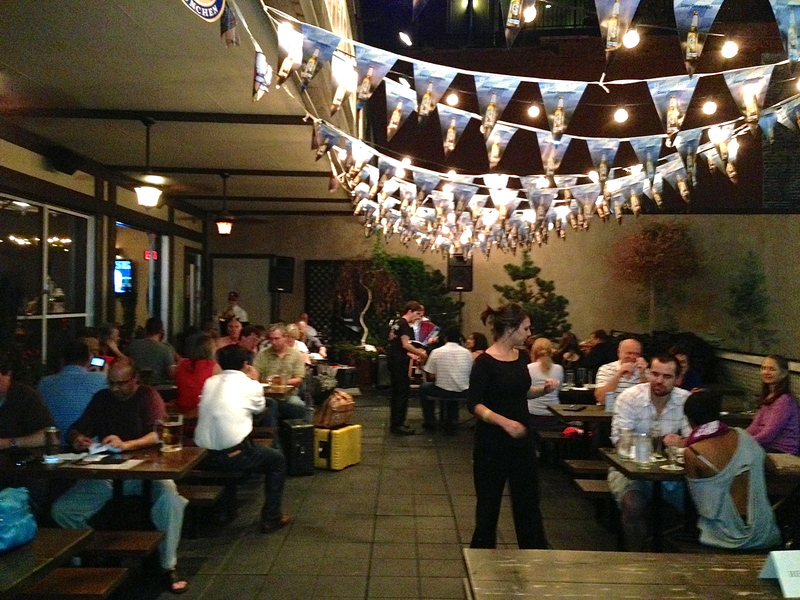 We can see why Der Biergarten was voted one of the ten best in the country. Thanks to C & R for helping us celebrate Oktoberfest. We’ll be back next year! Show us your lederhosen! Happy Oktoberfest from all of us at Date Night!